Calvary Community Church, Hampton, Virginia, 2012. 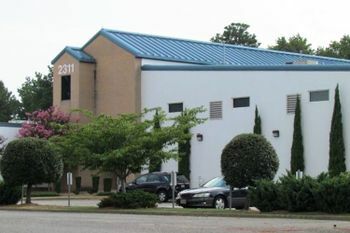 The Calvary Mennonite Church (formerly known as Madison Avenue Chapel) (Mennonite Church), Newport News, Virginia, began as an African-American mission established by the Warwick River congregation in 1952. Prior to that date a layman, Nelson Burkholder, held street meetings on Jefferson Street, in the African-American section of Newport News. Burkholder was ordained in 1952 by the Warwick River congregation to start an interracial church in Newport News. A house was purchased on Madison Avenue, and renovated to serve as a meetingplace. Only two youth from the community attended the first service on 28 November 1952. A larger facility was soon needed, a five lots were purchased on Wickdown Avenue, several blocks from the chapel. The first service at the new location was held on 14 April 1957. Its name was changed from Madison Avenue Chapel to Calvary Mennonite Church at that time. In 1958 the congregation had 10 members, with Nelson Burkholder as pastor. Leslie Francisco II, a local African-American, began attending services in 1958, and was made deacon in 1960. He was ordained as a minister in 1966, and began to serve as Associate Pastor along with Burkholder. By 1970 the congregation had grown to about 80 members and Leslie Francisco II was serving as co-pastor with Burkholder. In 1971 Francisco became the lead minister and Burkholder continued as assistant. Gradually the white "drive-in" members stopped attending, and the vision for an interracial congregation was lost. An addition of classroom space, a fellowship hall and kitchen were added in 1976. Leslie Francisco II had a spiritual renewal in the late 1960s that led him toward a freer, livelier worship form than had been the case previously, combined with a greater emphasis on the leading of the Holy Spirit. This hastened the departure of white members who were more accustomed to a traditional service. Francisco developed a conviction to build a church in Hampton, Virginia, a city adjacent to Newport News. Finally a property became available and in July 1985, and the new church facility (Calvary Community Church) opened. Francisco's son, Leslie III, served as interim pastor of the Newport News congregation and was ordained in June 1986. In November 1987, the two congregations agreed to merge into the Calvary Community Church. The latter in time became the largest Mennonite Church in the United States. The Newport News location then closed. In 2014 the church had 1,445 members and was served by Ministers Leslie W. Francisco, Natalie A. Francisco, and Cynthia A. Guyton. Bechler, Le Roy. The Black Mennonite Church in North America, 1886-1986. Scottdale, Pa: Herald Press, 1986: 144-170. Carpenter, Steve. "Ministry of Bishop Leslie II and Naomi Francisco celebrated." Connections 17 (November 2006): 1. Bender, Harold S. and Sam Steiner. "Calvary Community Church (Hampton, Virginia, USA)." Global Anabaptist Mennonite Encyclopedia Online. March 2010. Web. 25 Apr 2019. http://gameo.org/index.php?title=Calvary_Community_Church_(Hampton,_Virginia,_USA)&oldid=117416. Bender, Harold S. and Sam Steiner. (March 2010). Calvary Community Church (Hampton, Virginia, USA). Global Anabaptist Mennonite Encyclopedia Online. Retrieved 25 April 2019, from http://gameo.org/index.php?title=Calvary_Community_Church_(Hampton,_Virginia,_USA)&oldid=117416. This page was last modified on 6 April 2014, at 07:05.